One of the most compelling reasons for my return to Spain would be jamón. Jamón, simply translated, is Spanish for ham. But where we may differentiate between lunchmeat ham and a baking ham, with further adjectives like Virgina ham or spiral cut, etc, etc, Spain doesn’t mess around. Yes, you can divide ham into those same two categories (jamón york o una pierna de cerdo), but overshadowing them by far is a third category: cured ham or jamón serrano. 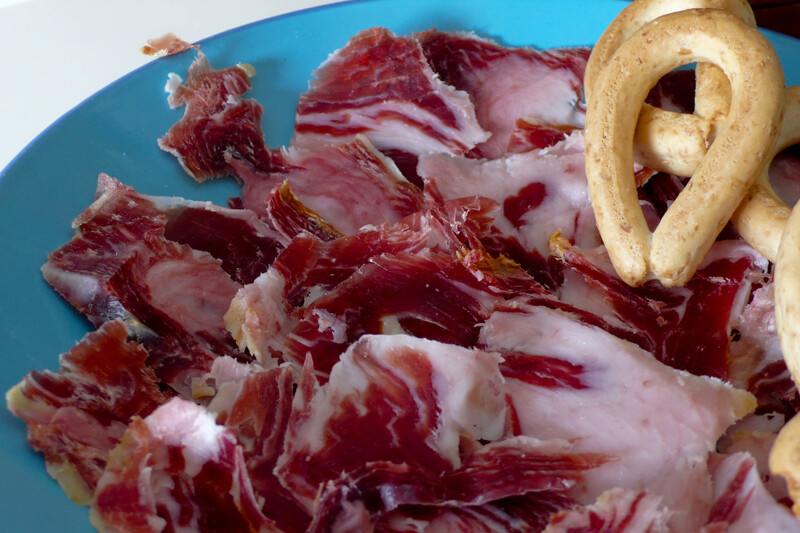 Most Americans have never had the luck to try jamón serrano, though this may be changing with Spanish cuisines infiltration of the hoity-toity world palate. But most of us are familiar with prosciutto, the Italian cured ham. This makes sense, given the heavy and heaven-sent influence of Italian immigrants on American culture, especially in the east. But sorry, jamón is way, way better. 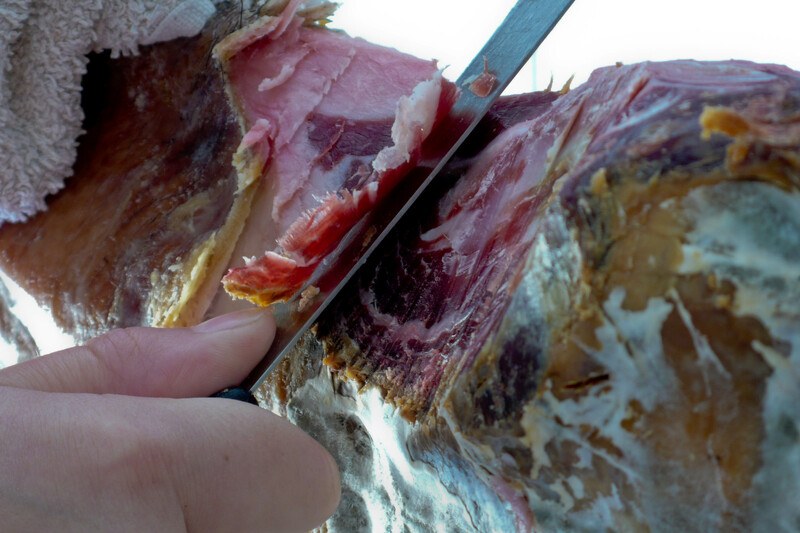 Jamón serrano is to Spaniards like wine is for the French, on a simpler level. 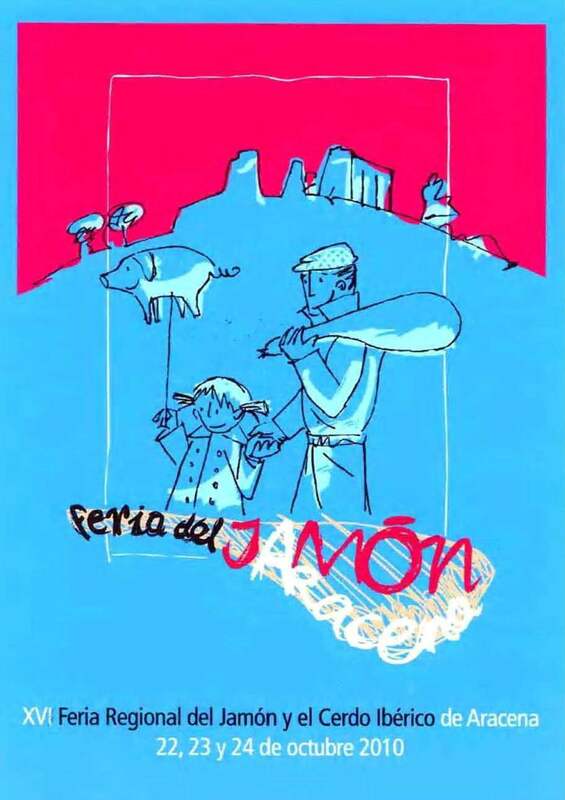 Where wine is separated into different categories based upon grape varieties and the region of origin, jamón is divided into categories depending on the diet of the pig and region of origin. The French wax lyrical about different tasting notes, and you can hear a similar tenor of tender love for jamón in the voices of men in tapas bars dotted through Spain, especially Andalucía. Talking about the difference between the front legs (paletas) and back legs (patas), how much meat versus fat is in each, the texture, the color, etc. The wine connoisseur can talk about the debate on plastic corks, buy aerators and wine racks. 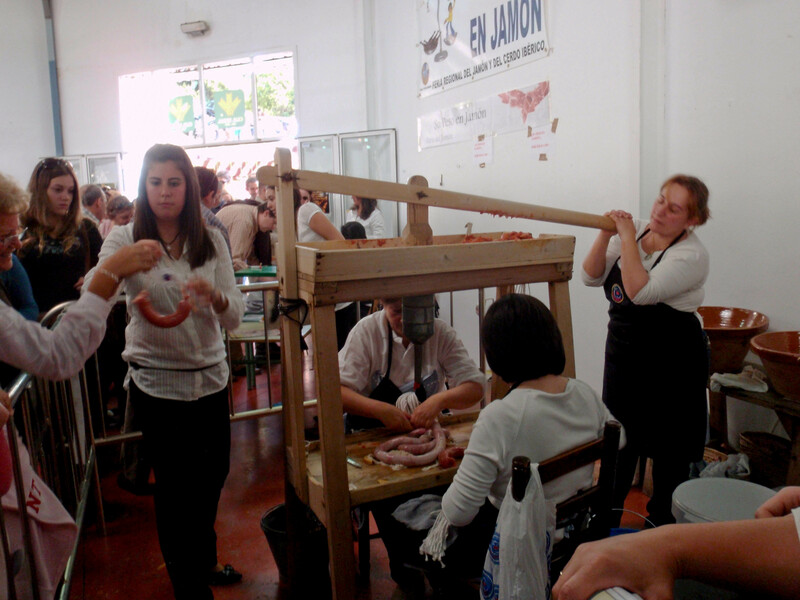 The jamón aficionado can compare models of jamonera (ham stands, also called jamoneros), knife brands, and critique each others cutting skill. I do not pretend to be a jamón expert. I do however swear that I love jamón. My roommate, Rosa, has declared that I may just love it more than Spanish people. Unfortunately I had defective Spanish that day and thought that she was of the opinion that I would choose a leg of ham over a Spanish man. Depending on my mood, she may be right. Of course, I’m now on the lookout for a man who comes with a pata de jamón. That’s my new dream. Thanks, Rosa, for giving me new and difficult standards. 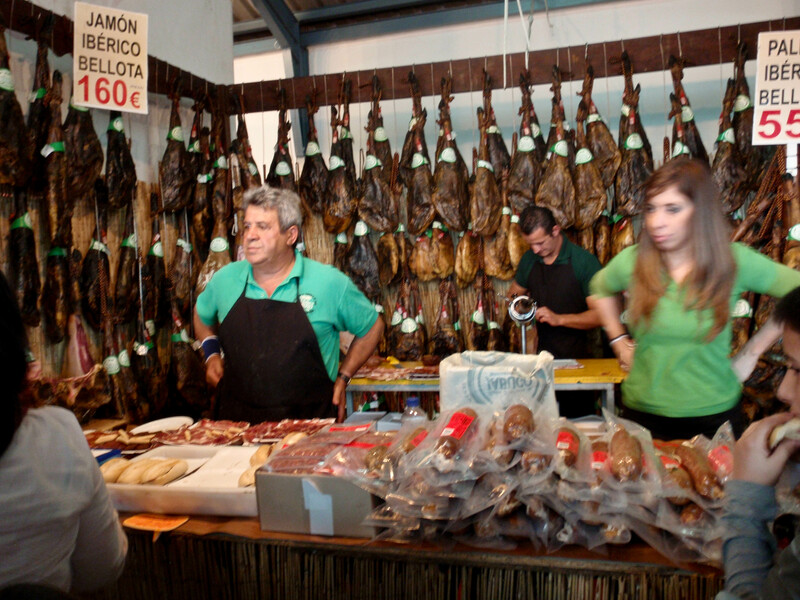 My love of jamón, however, took us to a new and wonderful place – the Feria del Jamón of Aracena. With a poster like this, who could not go? This is now on my bedroom wall. 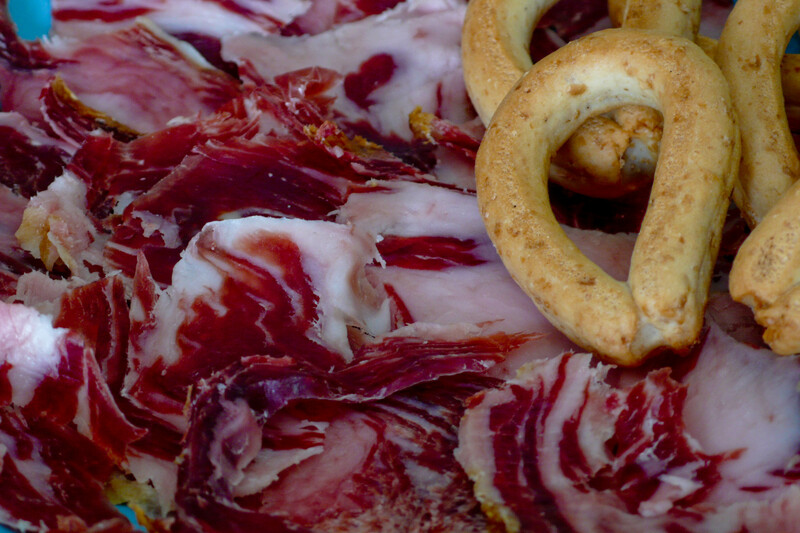 When I heard that there was a festival devoted solely to jamón, I would not shut up until I was promised a short road trip to m personal heaven. Google maps led us on a very scenic and very slow and scary trip through the Sierra de Sevilla and Huelva, but we eventually arrived shaken and sound. It was worth it. People were not saying ew, but elbowing each other subtly aside in order to buy fresh, handmade chorizo. I had found my people. 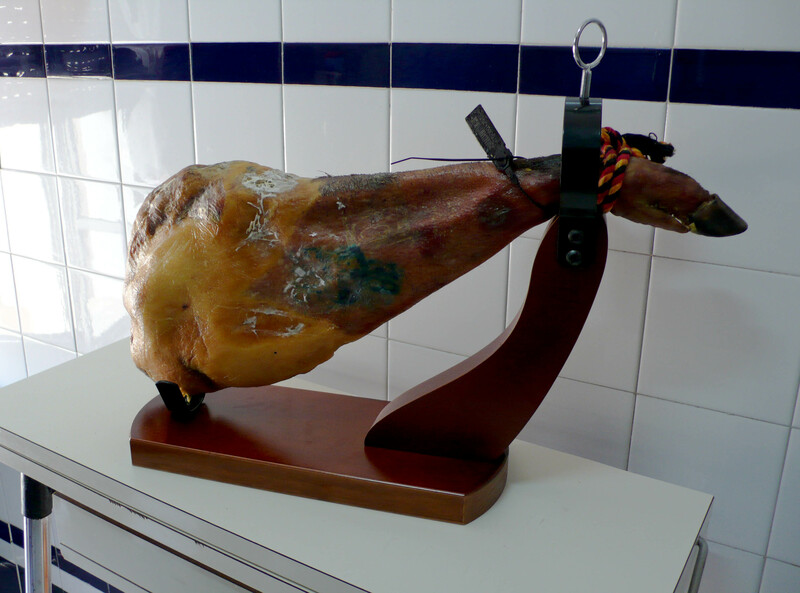 As I was at the Feria del Jamón, what could I do but… buy some jamón. From that store right above. I bought a paleta, which is a front leg a higher ratio of tocino, or fat, and less meat and fat over all. Which is of course why it was within my budget. The drama of the paleta was that we had no jamonera, or stand that holds the leg in place while you slowly slice of little slivers of tasty. We got one on loan from the family of Marina, our other roommate, but it had no screw to hold the little trotter in place and as she is moving, the jamonera moves, too. 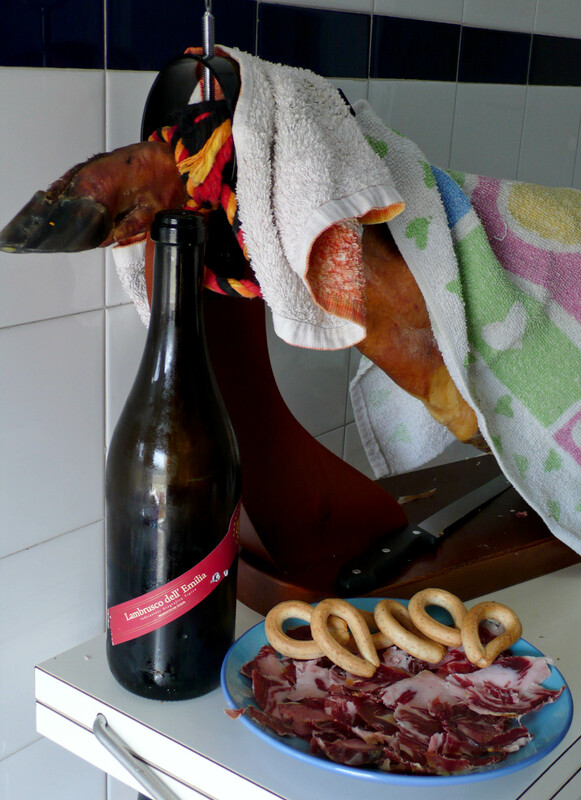 But finally, we bit the bullet, and bought our very own jamonera. I’ve gotten a lot of advice from a lot of people on how to carve a jamón. But what they all agree on is a sharp knife. First thing you have to do is cut away the outside fat from what you want to eat. Don’t take off any more than you have to, because it protects the jamón while you slowly work your way through it. The trick that only comes with practice is to strip off the fat and as little of the jamón as you can in the process so there is more for the eating. And of course, a sharp knife helps with that. 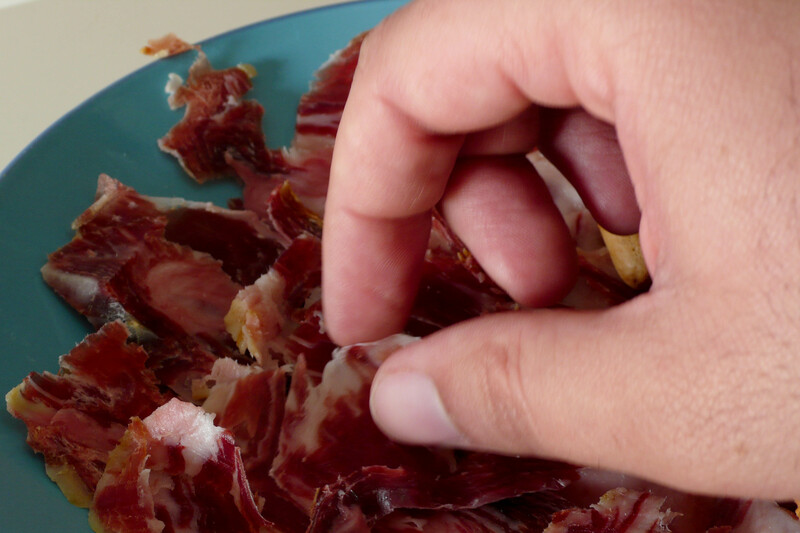 Here you can see we are using a dish cloth to protect our hands, because the jamón is very hard, and if you aren’t super practiced, you can very easily cut yourself. In a few days we’ll go to the jamón store nearby and buy a little plastic shield. 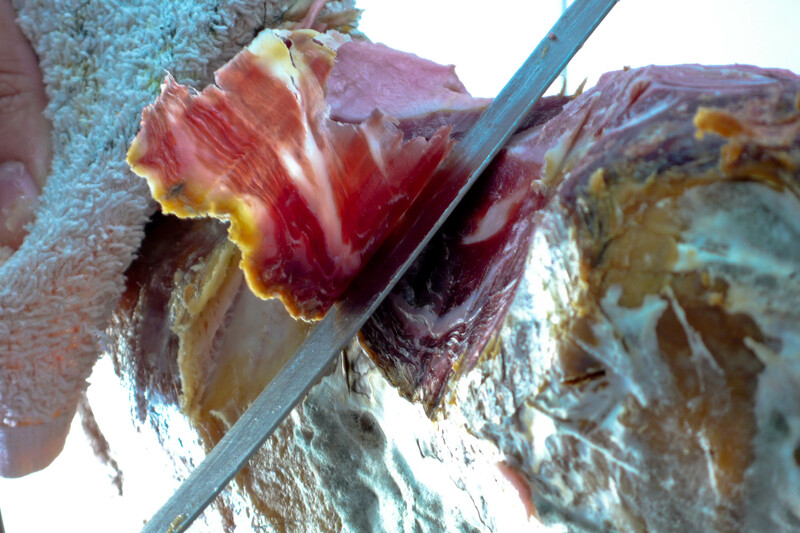 The thinner the slices, the tastier the jamón. It’s hard cured, so if you cut thicker slices, it takes quite awhile to work your way through it. But, thicker slices can be tossed into soup to make it exponentially tastier. The marbling of white fat and wine dark meat I find actually quite beautiful. This is a picture of my first crack and slicing jamón and it’s actually quite zen. You tug the knife slowly through the meat and it peels away like tiny bit of stained glass. Except with the expectation that when you’ve finished with your art, you can eat it. Which makes it better. One other thing that I love? Lambrusco. This is a red wine lambrusco, which means it’s a combination of champagne and red wine. Yeah. that’s right. Also pictured are the very necessary picos. They are little bread sticks that cleanse the palate and prepare you for more jamón. It’s a very very strong flavor, and if you eat it straight, it coats the palate and you can’t really taste anything, including jamón. Jose got a little impatient with my picture-taking. And really, who can blame him? 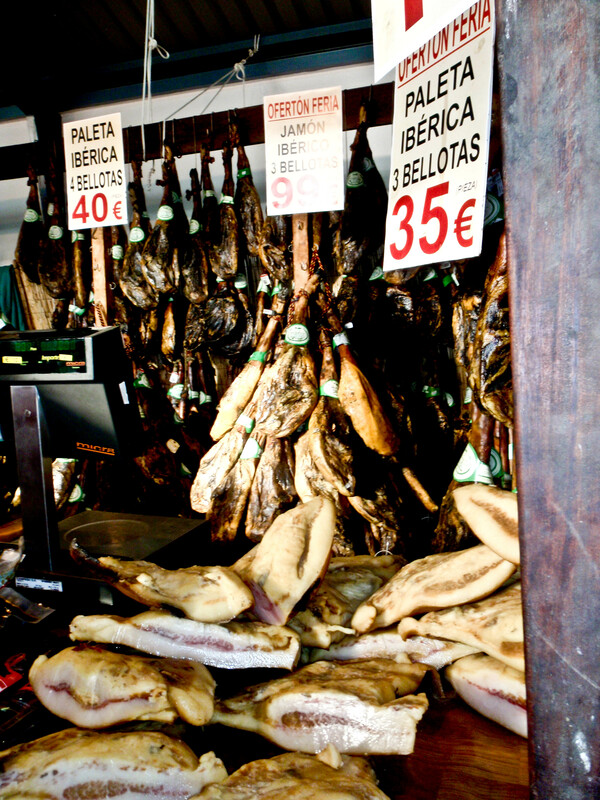 So much about this post makes me both happy and long to visit you in Spain because we could eat our cured salty pig parts in peace, amongst people who understand us. Hello best friend. Or should I say Hola amiga besta (no I don’t speak Spanish, it’s on the bucket list). This article made me remember why you are my best friend. As well as thoroughly jealous that I don’t have jamon to eat right now.